While the idea of sparkling water directly from your tap may not seem real – this is a reality with the GROHE Blue Home. The GROHE Blue Home has a simple and intuitive mechanism that lets you carbonate your drinking water at the touch of a button, providing you with deliciously cool, filtered still or sparkling water straight from the tap to your glass. With summer around the corner what better way to provide healthy and refreshing thirst quenchers for the whole family. To start your inspiration whether you are having a braai or simple relaxing afternoon there is a something for every palette that our GROHE Blue Home brings to life. These thirst quenchers are sure to tantalise your taste-buds and make you the hostess with the mostess. Remove peel and pineapple core, then dice neatly. Halve one orange. Juice one half using a lemon juicer. Slice the other half thinly. Place orange juice, orange slices and pineapple chunks in the GROHE Blue carafe. Rinse three stalks of fresh lemon balm and add with two tablespoons of lemon juice. Fill with 0.75 litres of GROHE Blue still or sparkling mineral water to your taste. Chill for at least 30 minutes and enjoy! Rinse and clean a handful of strawberries and slice very thinly. Peel ginger and slice very thinly. Add rinsed mint and all other ingredients to the GROHE Blue carafe. Fill with 0.75 litres of GROHE Blue still or sparkling mineral water to your taste and leave to infuse for 30 minutes. Cheers! Cut pomegranate in half. Juice one half using a lemon juicer. Remove seeds from the other half (hold under tap to avoid squirting). Remove peel and pineapple core, then dice neatly. 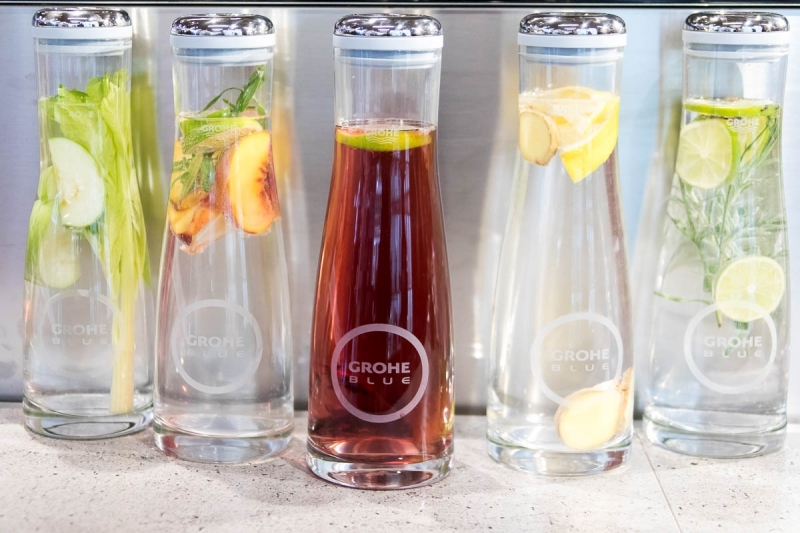 Place pomegranate juice and seeds and pineapple chunks in the GROHE Blue carafe. Rinse one rosemary stalk and two mint stalks and add to the carafe. Fill with 0.75 litres of GROHE Blue still or sparkling mineral water to your taste. Chill for at least 30 minutes. Whether you are looking for something to revitalize you or a simple twist that transforms water the GROHE Blue Home has it all.